David Hubbard joined Verizon in 2004—the same year that an experimental little social network was launched at Harvard University. “I remember the first meeting we had about this thing called ‘Facebook,’” he says. Over the next decade he, Verizon, and the world watched social media grow from a network of college students on desktop computers to a multiplatform, multiuse communication tool that permeates all aspects of business. As vice president and deputy general counsel, Hubbard still has meetings about Facebook, but these days he spends more time considering all the legal considerations of marketing and advertising in a digital age. How has social media internally impacted the business world and, more specifically, how has it externally changed Verizon’s relationship with consumers? Which laws are applicable to social media, and how does one navigate this largely unregulated territory? If the World Wide Web is the cyberversion of the Wild West, social media is still a new frontier that Hubbard and his legal team explore with one eye looking for pitfalls, the other for opportunity. During the “dot-com” era of the late 1990s and into the early 2000s, people started utilizing their home computers to engage with businesses, have social experiences, and shop from the comfort of their homes. The later 2000s marked the dawn of what Hubbard classifies as the “digital era,” when the at-home experience became an “everywhere” experience, and consumers expected accessibility to companies, services, and other users from anywhere. As soon as social media launched, legal issues caused by it have existed. Laws regarding intellectual property rights, endorsements and testimonials, marketing, advertising, and clear and conspicuous disclosures are now being applied to a very different platform than the ones for which they were written. Internally, Hubbard, his team, and colleagues scrutinized potentially applicable laws when writing Verizon’s first social media policy. They attempted to identify what needed to be protected, permitted, and promoted with respect to Verizon’s social media practices. They brought pertinent information to the marketing, public relations, internal information technology, network and technology, and compliance departments and worked together to develop a thorough policy. “We were considering how to address things like maintaining transparency and truthfulness in all communications, protecting customer information and the confidential information of Verizon and any third parties, and protecting third-party intellectual property,” Hubbard says. “We needed to decide who to train and how to train them and how aware of these issues other employees needed to be.” Hubbard and his team then created a general policy and training for all employees. Externally, advertising became an important online presence, allowing Verizon to utilize the instantaneous marketing that social media provides. Another necessary presence was hosting the brand’s pages on various platforms. Still both of these are examples of passive presence on social media—generic monologues for a large audience rather than an invitation to a more personalized dialogue. It was a significant shift when Verizon began to allow for intentional conversation in their marketing plan, and that potential for individual interaction created difficult legal questions for Hubbard and his team. For example, it’s common for individuals to post photos they don’t own, which usually doesn’t pose a problem. If a brand like Verizon did the same thing, however it could violate copyright law. In the same way, when a private person tweets at a celebrity, they’re considered a fan. If Verizon tweets at the same person without permission or a formal agreement, it could be viewed as an endorsement, possibly violating the celebrity’s right of publicity, or at a minimum be seen as an indication of affiliation with the celebrity. Another challenge is keeping up with the speed of social media and relinquishing the amount of control that is typically enjoyed in traditional advertising. Responding to consumers in real time does not allow the luxury of double-checking scripts or providing legal guidance before every exchange, so Hubbard and his legal team have created tiers of situations and offered training on how to address each tier. Verizon now has a customer service, research, and marketing teams that are completely dedicated to social media. These teams have largely been empowered to handle issues on their own, and to call for legal guidance when the tiers do not apply or the issues go beyond their comfort level. legal professionals must be prepared to address them. Hubbard’s goal for Verizon’s in-house legal team is to be the best in class in marketing, intellectual property, and media legal organization. That requires being close enough to the business to understand and share in organizational goals, recognize the direction of the industry, collaborating with all relevant stakeholders, and researching with the help of external experts and like-minded legal professionals in other businesses through participation in the Social Media Attorneys’ Roundtable. 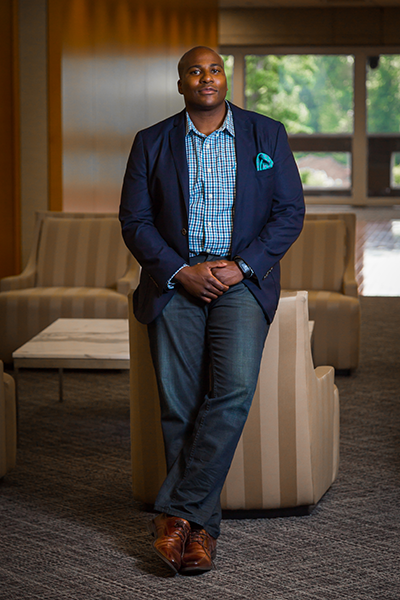 “Our ambitious goals and Verizon’s innovative endeavors push me to think about things differently, to challenge myself, and to grow as an individual and a lawyer,” Hubbard says. creatively about using old laws to solve new problems. For Hubbard, challenging the status quo as an in-house lawyer means enabling Verizon to do what they do best, and in the cyber-Wild West, he is proud to always have his company’s back.